This is the first and central liturgy of Easter that begins on Saturday night. 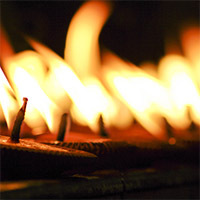 Beginning in holy darkness out of which the Easter fire is kindled and candles are lit, we recount from our scriptures the saving works of God. Children will hear Godly Play stories in Children’s Chapel and rejoin the congregation to celebrate and share Eucharist. Lights, bells, and incense attend the joyous resurrection celebration that marks the start of fifty days of Easter.